The St. George’s Foundation is getting set to host Dr. Edward Harris of the National Museum of Bermuda, along with two special guests, for a lecture and slideshow highlighting the 19th century artwork of Johnson Savage. The event will take place on Saturday, April 5 at 3.00pm. A spokesperson said, “We are excited to host Dr. Ed Harris of the National Museum of Bermuda, and special guests Peter and Rosemary Savage, for a limited-seating one hour lecture and slideshow featuring historical artwork from the 1830s by Dr. Johnson Savage. “One day in the three-year period, from 1833–1836, perhaps around the heady days of the emancipation of the remaining slaves in Bermuda, the young Royal Artillery surgeon Johnson Savage set about on a walkabout in the Parish of St. George’s, armed not with sword and musket, but with brush and paint, intent on capturing scenes, rather than enemy soldiers. That cache of artwork was recently donated to the National Museum through the assistance of museum member Dr. Adrian Webb. The album contains 39 watercolour and pencil drawings that depict landscapes of Bermuda and local activities from 1833–36. This exquisite album contains panoramic and harbour views, and scenes of 19th century activities such as whale processing, shipwreck salvage, boat repair, selling fish and produce, tending cattle, and collecting firewood. Johnson Savage MD, who was stationed at Bermuda in the mid-1830s as a young surgeon with the Royal Artillery. His paintings were not previously known but stand comparison with the best of the artist Thomas Driver whose work spans the period 1814 to 1836. Johnson Savage’s grandson was also connected with Bermuda: he was Lieutenant Arthur Johnson Savage RE, a surveyor for the Royal Engineers who was stationed at Bermuda to carry out the first Ordnance Survey of the island in 1897, a task that was completed a few years later and published in 1901 in six sheets. The detailed large-scale survey is still in use and can be seen in the Bermuda’s Architectural Heritage series by the Bermuda National Trust. The great-great grand children of Johnson Savage — Major [RE Retd.] Peter Savage and his siblings Major [RE Retd.] William Savage and Mrs. Jenifer Hancock — have now donated his album to the National Museum through the assistance of museum member Dr. Adrian Webb. After 179 years in the possession of the Savage family, they felt that the album of paintings and sketches should permanently reside in Bermuda, continuing the historic Savage family connection to the island. It is a major addition to the Museum collections, and a significant cultural asset to Bermuda, given its early date and the content of the images. An exhibition on the album in 2015 will coincide with the publication of a book on the Johnson Savage MD Collection and the longstanding connections of the Savage Family with Bermuda. For many Blacks these paintings help to draw upon a place in time that we can only imigine today. Seeing these images, especially through the eyes of some-one who was privileged, educated and talented should, in itself, give us an impression of the artist, the man and his subjective matter. Why did he chose the subjective matter of everyday life as opposed to concentrating on painitngs in his profession of medicine? 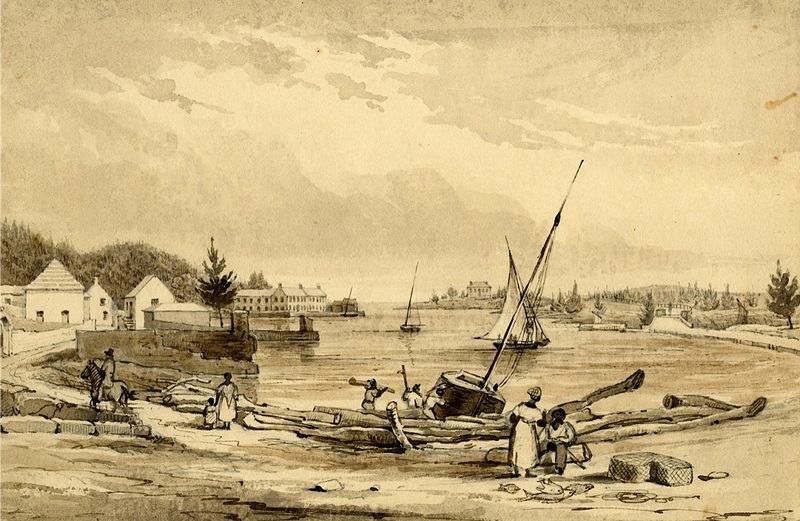 What drew him to cast his talented eyes over the everyday work life of Blacks, in Bermuda? Or was there no particular reason other than he found everyday life intriguing? It is very rare for early paintings to depict Blacks, and the earlier one goes in history the rarer it becomes. So, my humble thanks to the late Dr Savage, whatever his reasonings were as the paintings choniclise the lives of Blacks in Bermuda as a snapshot into our past.